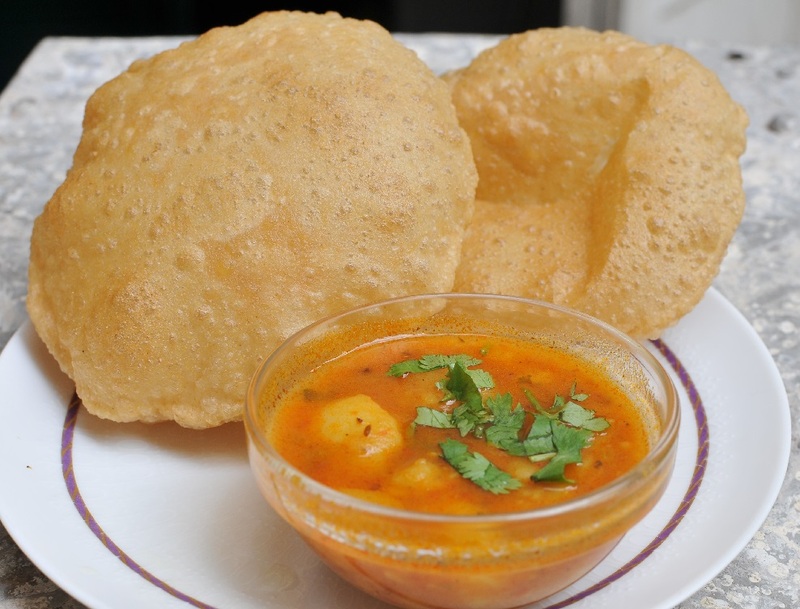 Puri: Puri or poori is an unleavened deep-fried Indian bread, commonly consumed on the Indian subcontinent. It is eaten for breakfast or as a snack or light meal. It is usually served with a curry or bhaji, as in Puri bhaji. Puri is most commonly served at breakfast. It is also served at special or ceremonial functions as part of ceremonial rituals along with other vegetarian food offered in prayer as prasadam. Puri can be served with halwa, korma, chana masala, dal, potato based curries, shrikhand, basundi. In some parts of India, puri is also served with a mixed vegetable dish that is prepared during Puja, and with kheer, a dessert prepared with rice, milk and sugar. Sieve the whole wheat flour with salt. Add in melted ghee or oil. Knead the flour and oil mixture for 5 minutes. Knead the flour, adding little water at a time, to form a dough. The dough should not be soft but a little stiff and tight. Divide the dough into 12-45 small or medium pieces. Roll out the dough pieces out into small circles. Heat the oil in a deep frying pan or kadai, at 180°C. Add one puri circle at a time and fry gently pressing down with the frying spoon or slotted spoon in a circular motion. Turn over when puffed up and fry the puri till golden brown. Puri’s are ready to be served. Serve hot puri with a vegetable curry or sweet dishes like suji ka halwa or aam ras. If you have any queries regarding the Puri recipe, please leave a comment.